The game raised school spirit and funds to support breast cancer research and care at MD Anderson Cancer Center at Cooper. 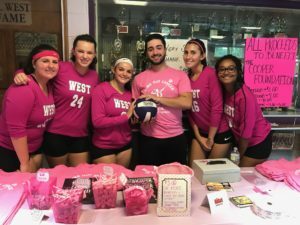 “It was great to see everyone so involved and so excited,” said Alexa, 17, who came up with the idea for the special fundraising match after playing in a similar game last year at Washington Township High School. With the support of her coach and help from her teammates, Alexa took the idea and ran with it. In addition to charging a $2 admission fee to the game, the team also held a bake sale and sold T-shirts, and donated all proceeds to The Cooper Foundation to benefit MD Anderson at Cooper. 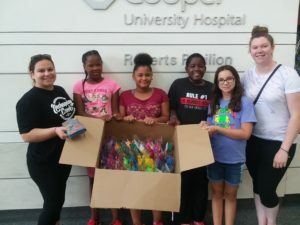 Earlier this year, another group of young people also came together to help patients at Cooper. Foster children participating in a mentorship program at Oaks Integrated Care donated 30 handmade teddy bears to the Child Life Program to benefit pediatric patients at Children’s Regional Hospital. The project was the idea of Stephanie Rahinsky and Gillian Utain, who are both pursing their master’s degree in social work from Stockton University and serve as mentors for the children Oaks Integrated Care serves. Under Stephanie and Gillian’s guidance, the children – ranging from 5-year-olds to teenagers – made the teddy bears using felt shapes that they stuffed and stitched together. They added their personal touch to the outside, and inside, they tucked a tiny heart. Do you want to make a difference in your community? Consider a service project that supports patients at Cooper as well as families in need in South Jersey. The Cooper Foundation welcomes the chance to partner with students and other groups that share our passion for giving back, so please get involved today, and help us help others. For questions or more information about how you can get involved and support The Cooper Foundation, call 856.342.222 or click here to visit our website.